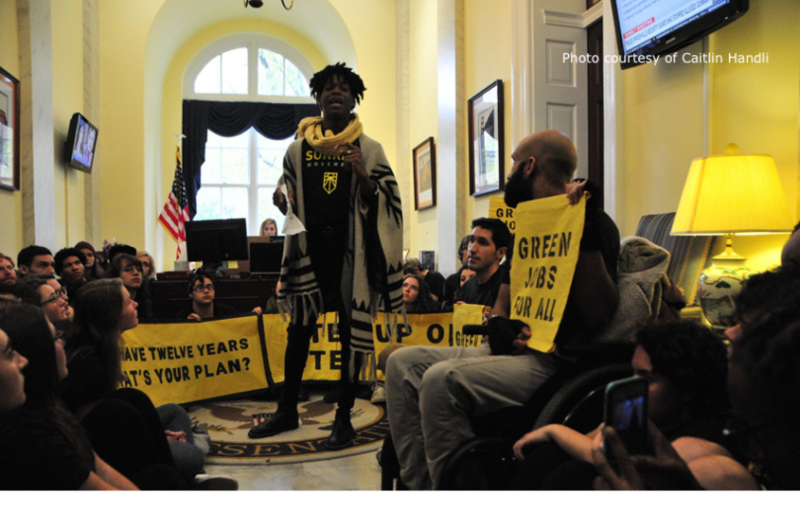 On Nov. 13, 2018, a week after the midterm elections, over 250 youth political activists held a sit-in on Capitol Hill in Speaker of the House of Representatives Nancy Pelosi’s office. 12 activists were students from West Chester University and the surrounding area. In December following the midterms, we went back for more, where 1,000 activists flocked from all over the country to keep pressure on our elected officials before Congress adjourned for 2018. Welcome. We are Sunrise. We are a movement to stop climate change and create millions of jobs in the process. We are building an army of young people to make climate change an urgent priority across the country, end the corrupting influence of Fossil Fuel CEOs on our politics and elect leaders who’ll stand up for the health and well-being of all people. This is about the people and places that we love. Climate change is real, and it has had devastating effects in all parts of the world. Wildfires in California have taken the lives of over 98 people and destroyed over 12,000 homes. Landslides in the Philippines have killed more than 60 people and displaced over 40,000 people. Sinkholes in Chester County due to pipelines threaten the health, well-being and safety of our family members and friends. It is clear if we do not make rapid, structural transformation to our society — life as we know it will collapse. The fossil fuel industry and the lack of care from our representatives to take a bold stance on climate change are to blame for this crisis. The Intergovernmental Panel on Climate Change (IPCC) came out with a report that if we do not make change now, the effects will be irreversible. The solutions to these problems are not impossible. In fact, we have the renewables ready to replace fossil fuels and create millions of jobs across the country. The only thing getting in our way is that billionaire fossil fuel executives have bought off politicians and halted the action we need. This is about the people and places that we love. We need to come together to break our country free from the grip of fossil fuel billionaires who are holding us back from a safe and prosperous future. We have the necessary tools, resources and support. We are the leaders we need to make this societal change. Will you join the army? For questions, please email a Sunrise Hub Coordinator at CH865109@wcupa.edu or at sunrisemvntwestchester@gmail.com.